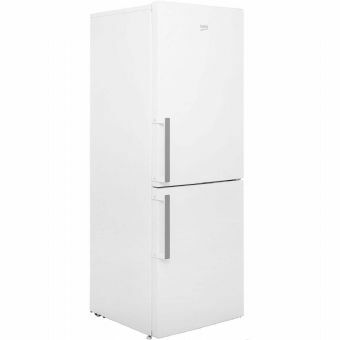 Simple and fuss free, this white fridge freezer from Beko offers great functionality for busy households. With a 303 litre capacity, there’s space for 16 shopping bags of food. This model is low maintenance, thanks to frost free technology in the freezer. This continuously circulates cold air to stop ice forming on the cabinet walls – so you never have to manually defrost. It’s fairly inexpensive to run too, with annual energy costs of £44.81. The reversible door gives you great flexibility in your kitchen as it can open either to the left or right.